The municipality of Paxi (2,300 inhabitants in 2011; 3,012 ha) is formed by the smallest group of Ionian Islands. The largest islands are Paxos (Παξος) and nearby Antipaxos (Αντίπαξος). Antipaxos is famous for its wine and two of the finest sand beaches in the Ionian Sea. The main town and the seat of the municipality is Gaios (Γάιος, 561 inh.). The municipality was not modified in the 2011 local government reform. In Greek mythology, Poseidon created the island by striking Corfu with his trident, so that he and wife Amphitrite could have some peace and quiet. Although it was possibly inhabited from prehistoric times, the Phoenicians are traditionally held to have been the first settlers on Paxos. The Romans ruled the island from the 2nd century BC, and during the Byzantine period and Middle Ages it was constantly attacked by pirates. After various rulers and Crusaders had passed through, the island was taken by the Venetians at the end of the 14th century. During the Napoleonic wars, the Ionian Islands were taken by the French and the Russo-Turkish alliance. On 13 February 1814, the island of Paxos surrendered. In 1815, United Kingdom established the Ionian Union. In 1864, together with the rest of the Ionian islands, Paxos was ceded to Greece. 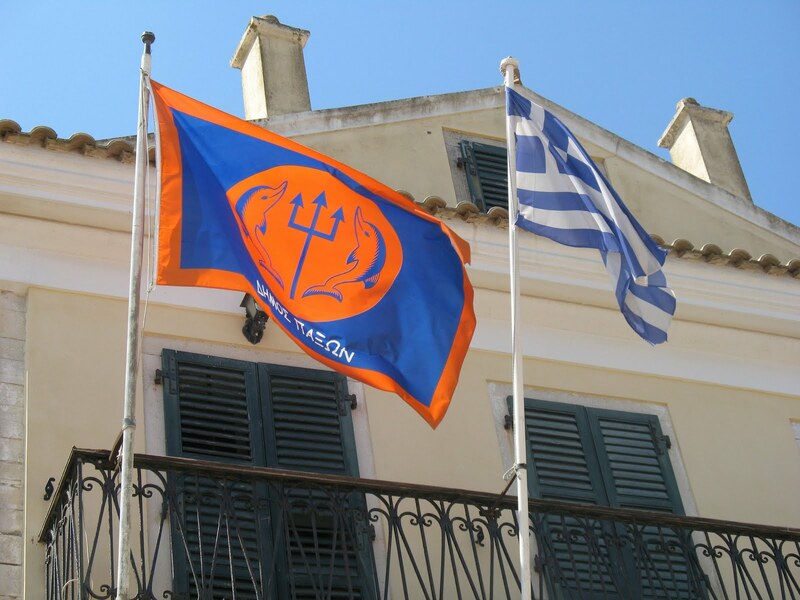 The flag of Paxi (photo) is blue with an orange border and the emblem of the municipality in the middle, showing a trident and two dolphins in blue on an orange background, and the name of the municipality, in white, below.